Cable display system installation made even easier. This rail track makes installation of cable display systems even easier. Instead of drilling individual holes for each cable display kit, simply fit a track to the ceiling and another to the floor. For displaying poster sets, use Cable Track Toggles (CC0013) to fit the cables to the track. Two required for each cable display kit (one at each end). These can slide in from the ends of the track or enter from the top. 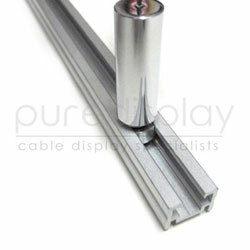 For displaying shelf sets, use Cable Track Fitting Locks (CC0012) to fit the cables to the track. Two required for each cable display kit (one at each end). These slide in from the ends of the track. Click here for an illustration of the cable track assembly. Tracks come in 2 metre lengths with 2 plastic black end covers. Track Toggles/Fitting Locks and Cable Display Kit not included. Optional cutting is available. Please allow an extra day for dispatch if this option is selected. Delivery to outside of UK mainland must select cutting 1M/1M.